A Schwarm of Bf109s from JG-52 are about to peel away and, with the battle-cry ‘Horrido!’ ringing in their ears, dive to attack the flight of enemy aircraft spotted below. JG-52: the name alone brought terror into the hearts of the Red Air Force pilots. 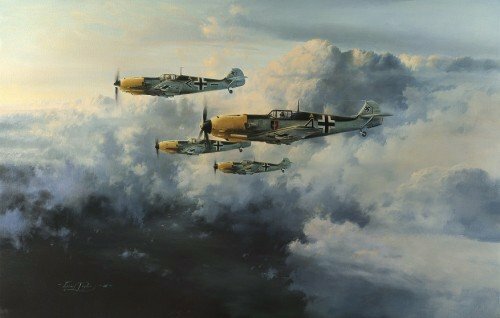 By the end of the war the Luftwaffe’s most successful Geschwader had claimed over 10,000 victories, and from within its ranks emerged the top three scoring Aces in the history of air combat; Gerhard Barkhorn, Gunther Rall and, of course, the highest scorer of them all – Erich Hartmann. One of the few Luftwaffe units to fly the Bf109 exclusively throughout the war, JG-52 spawned some of the most talented fighter pilots to take to the sky, honing their skills as they were joined by older, more experienced Aces, legendary names such as Batz, Graf, Steinhoff, Hrabak, Krupinski and Obleser.